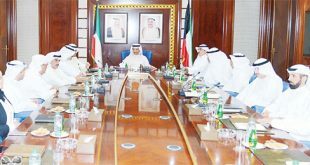 KUWAIT CITY, Feb 28, (KUNA): The Cabinet held its weekly session on Wednesday at Bayan Palace, under chairmanship of His Highness the Prime Minister Sheikh Jaber Al-Mubarak Al- Hamad Al-Sabah. 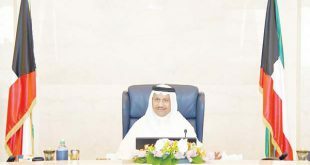 Following the session, Deputy Prime Minister and Minister of State for Cabinet Affairs Anas Al-Saleh stated that the ministers, on the 57th National Day and the 27th Liberation Day, expressed gratitude to all departments that had taken part in organizing festivities marking the national occasions. 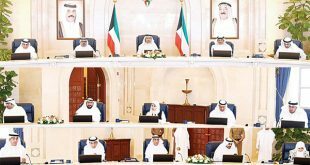 They deeply appreciated sincere sentiments of solidarity, expressed by citizens of GCC and friendly countries who also took part in the celebrations, thus depicting the admired status enjoyed by the State of Kuwait among these countries. 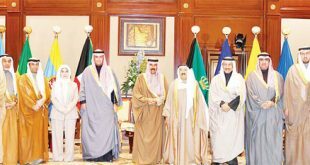 The ministers expressed good wishes for Kuwait, His Highness the Amir and His Highness the Crown Prince on these occasions. 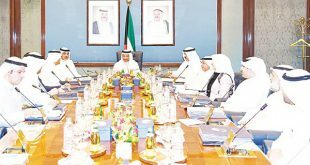 Deputy Prime Minister and Foreign Minister Sheikh Sabah Khaled Al-Hamad Al-Sabah briefed the fellow ministers about results of his recent visit to the United States of America, where he attended the United Nations Security Council sessions, currently presided by the State of Kuwait. These sessions addressed the humanitarian situation in Syria and the efforts that had been exerted for passing the UNSC Resolution for ending the bitter humanitarian hardships in Syria by unanimity. The resolution called for ceasing violent acts by all parties and dispatch of humanitarian aid to the besieged and the needy. The ministers expressed gratitude to the UNSC member states for their keenness on releasing the significant resolution to alleviate the humanitarian hardships, suffered by the brotherly Syrian people, expressing hope that it would be implemented for sake of halting blood shedding suffered by the Syrian people. 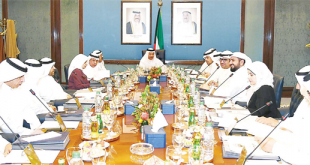 The Deputy Prime Minister and Foreign Minister briefed the executives about his meeting with Palestinian President Mahmoud Abbas on sidelines of the UNSC sessions, noting that President Abbas praised the State of Kuwait unwavering stand in supporting the Palestinian’s just cause, their struggle to end the Israeli occupation and attain their legitimate rights, namely establishing the independent state with East Jerusalem as its capital. 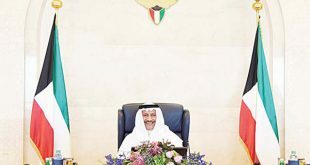 Sheikh Sabah Khaled affirmed that the balanced Kuwaiti diplomacy, guided by His Highness the Amir, was complementary to the regional and international efforts to resolve humanitarian causes and fulfil all tasks needed for serving the international community and the causes of global peace, security and stability.